Modern Painting and Sculpture in Ireland. In Connemara (c.1910) by Paul Henry. The history of Irish art during the first sixty years of the twentieth century reflected all the birth pangs of a young state, the isolation experienced during World War II, and later the struggle for economic prosperity. Few Irish artists of this period had an easy life; many nearly gave up art altogether; but it is fair to say that all viewed their art and their Irishness through very different eyes from their predecessors of the nineteenth century. One might say, during the twentieth century Irish painting has metamorphosed from an inchoate set of British-influenced artistic traditions into a more mature art form, incorporating all the ruggedness of an Irish Celtic past as well as its own interpretation of European art and the confidence to embrace itself as a unique culture, despite continuing political controversy. Several influences were apparent in Irish art during this time. They include: nationalism, realism, a revival of interest in the Celtic West of Ireland, European culture, as well as modernism associated with the Living Art Exhibition. Nationalism was a focus for many artists during the first quarter of the century. 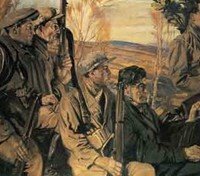 Sean Keating (1889-1977) was an Irish romantic who executed several iconic images of the rebellion and its aftermath (eg. Men of the South, 1921), and thereafter depicted the industrialization of Ireland in heroic terms. Realism too, (or representational art) came naturally to the new generation of Irish artists anxious to embody real Irish subjects in their paintings. Unlike the Edwardians like Lavery and Orpen, whose war realism was 'international' and Victorian, modern realists like Paul Henry (1876-1958) and William Conor (18811968) focused on mundane Irish realism and took as their subjects the everyday life and poverty of the Irish people - in Henry's case the peasant inhabitants of Achill Island and other rural locations. Both Keating and Henry were exponents of Irish representational painting. In contrast, Jack B Yeats' work was expressionist. He depicted a wide range of Irish scenes, from street scenes to funerals, to horse races and boxing contests - all closely observed and all quintessentially Irish. And all executed in a new style, verging on the European. As well as this new 'Irish' realism, other painters, like Maurice MacGonigal (1900-1979) and Sean OSullivan (1906-1964) belonged to a tradition of academic realism in both portrait art and landscape painting. A Family (1950-1) by Louis le Brocquy. The Celtic West of Ireland was different from the rest of the country. Less urban, less advanced, more traditional, more "primitive" - in a sense more representative of real Celtic or Gaelic culture. It drew any and every painter who believed in the ruggedness and purity of the nascent Celtic state. Unfortunately, these enthusiasts who flocked to the coastlines of Galway, Mayo and the islands, often tried too hard and ended up trying to ennoble Irish rural poverty. But Europe was never forgotten: there was too much creativity and too many new art movements in Paris and other cities, to attract Irish artists, of whom Mary Swanzy (1882-1978), Mainie Jellett (1897-1944) and Evie Hone (1894-1955) were merely three of the first Irish painters to be affected. Returning to Dublin in the mid-1920s, they endeavoured to introduce Cubism to an Ireland (as part of a process of self-discovery) with a conspicuous lack of success. Later, such European modernism became more acceptable. Louis le Brocquy's acclaimed "Picnic" of 1940 displayed strong characteristics of the ninteenth century Impressionists Degas and Manet. The European tradition is maintained to this day by artists like William Crozier (b.1930). After the temporary experimentalism of the White Stag Group under Hall and Rakoczi, and the heart-felt Concentration Camp angst of Colin Middleton (1910-1983), the dreary 1940s affected Ireland even more than Britain. Artistic commissions were scarce. Emmigration became a feature of both Irish life and a subject for several of its artists, including Patrick Hennessy (1915-1980). Meantime, the more conservative art establishment was being challenged by modernists like the abstract painter Norah McGuinness (1901-1980) and Louis Le Brocquy (1916-2012). Along with Hone and Jellett, McGuinness and Le Brocquy had founded the Irish Exhibition of Living Art (1943) as a modern 'alternative' showcase for Irish painting deemed inappropriate to the Royal Hibernian Academy (RHA). Highly successful as a forum for the absorption of abstract and expressionist ideas, the Irish Exhibition of Living Art has attracted both emerging and established artists including such luminaries as Patrick Scott (b.1921), Tony O'Malley (1913-2003), Camille Souter (b.1929) and Barrie Cooke (b.1931), to name but four. The Irish Exhibition of Living Art continues to flourish in the twenty-first century. During the first half of the 20th century, Irish sculpture was largely devoted to commemorating deceased bishops, soldiers and rebels. For example, Seamus Murphy (1907-75), a notable graduate of the Crawford College of Art in Cork, was kept busy with endless commissions for portrait busts of eminent people of his day, including President Sean T. O'Kelly, Sean Lamass, Eamon De Valera, General Tom Barry, Jack Lynch, Frank O'Connell, and Sean O'Riada. Among Seamus Murphy's public monuments are those of Countess Markievicz and O'Donovan Rossa in St Stephen's Green, Dublin. Murphy was undoubtedly a traditionalist, in the sense of maintaining the traditions established by John Hogan (1841-1920), Oliver Sheppard (1865-1941), John Hughes (1865-1941), Jerome Connor (1874-1943), Albert Power (1881-1945) and others. So too, in his way, was the Belfast sculptor FE McWilliam (1909-92). However, the sculptors of the next generation, produced by the likes of Ian Stuart (b.1926), Alexandra Wejchert (1921-95) and Gerda Fromel (1931-75) tended to be more unrepresentational and more uncompromisingly abstract than most of the painters. Already the latest generation of Irish 3-D artists, led by Rowan Gillespie, are responding in highly creative ways to the new funding opportunities and the new foundries, including the National Sculpture Factory.  For details of 20th century painting and sculpture in Ireland, see: Irish Art Guide.  For information about modern arts and crafts in Ireland, see: Art Encyclopedia.